Enjoying the view from Tariser Paprika restaurant, just outside Alona. We knew Bohol Island needed to be on our Philippines itinerary. With natural wonders like the Chocolate Hills, amazing animal life like the Philippine tarsier, and stunning beaches it was an easy choice. Our biggest dilemma was where to stay in Bohol. 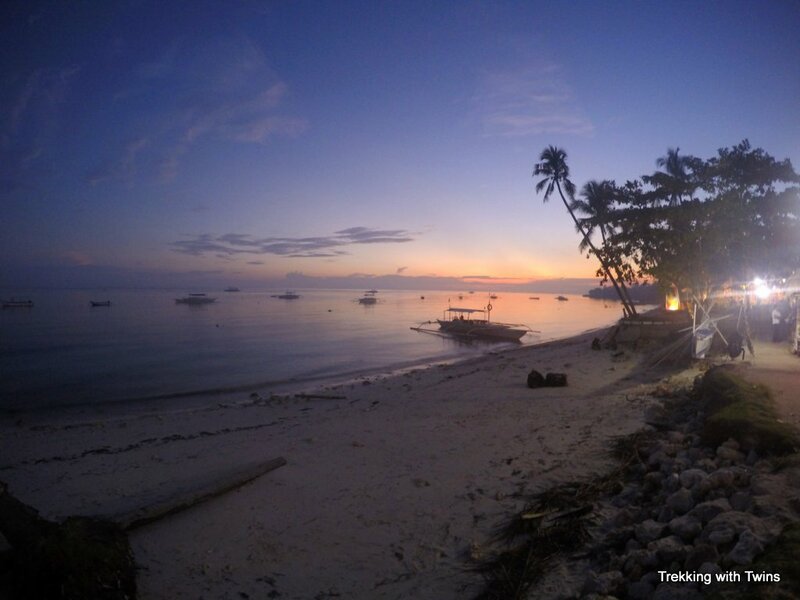 Many folks suggested that a good base for exploring Bohol Island would actually be Alona Beach on Panglao Island. We learned that Panglao Island is adjacent to Bohol Island and connected by two bridges, so it’s actually very easy to go between them. We had also heard Alona Beach on Panglao Island referred to as a “little Boracay” and we had a terrific family holiday in Boracay to start off our long term travel adventure. So we decided to check out Alona and see what it had to offer. In some ways the description makes sense, but there’s a totally different feel to Alona compared to White Beach on Boracay. Alona is laid back and quiet, even compared to station 3 on Boracay White Beach. Also the beach itself is not the main attraction at Alona. The big draw is really all of the activities for which Alona serves as the jumping off point. We’ve already written a lot about many of the activities in the area, island hopping, Bohol island tour, scuba diving at Balicasag Island, and visiting Dumaluan Beach. So this post is going to focus on everything else you need to know to enjoy a fun Bohol Island family vacation. Pressed for time? Bookmark our post for later and just check out this short video from our trip to Bohol. You’ll see why we liked it so much. The closest major airport to Alona Beach is in Cebu City. You then take a ferry to Tagbilaran, on Bohol Island. Finally you use ground transportation to go from Bohol to Panglao Island (across a causeway), where Alona Beach is located. There is an airport in Tagbilaran so it’s worth checking flight schedules to see if perhaps flying would be a better option for your trip. When we traveled to Alona we had already been in Cebu for a few days avoiding Typhoon Ruby, so we didn’t go directly from the Cebu airport to the port. We took a cab from our Cebu hotel to the port (100 pesos on the meter, $2). There are actually several piers that make up the Cebu City port so you have to check ahead of time to see which one has your ferry. We knew there were at least two ferry operations that went to Bohol Island from Pier 1 so we headed there. At the pier there was a row of booths for the various ferry companies with big signs advertizing fares. It was very easy to book our passage with SuperCat an hour or so before departure. It cost us 400 pesos ($9) each for adults and 205 pesos ($5) each for the twins. 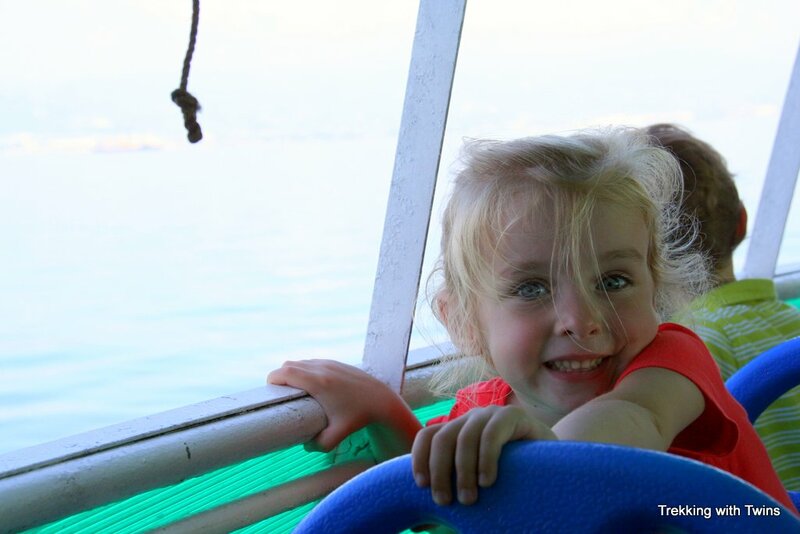 Aurora enjoying the ferry ride from Cebu to Bohol. On top of the fare you need to also pay a 25 peso ($0.50) port fee per adult after entering the terminal building. Our kids were young enough that we didn’t have to pay for them, but we don’t know the cut-off age. After paying the port fee we were herded over to an area to check in our larger pieces of luggage. While this only cost an additional 90 pesos ($2), checking the bags probably wasn’t necessary. It was certainly easier not carrying them but we were physically capable of doing so, and the bags ended up just a few feet away from our seats on the back of the boat anyway. We actually carried them off the boat ourselves. The seats on the boat are assigned, and we went for the cheaper outside air seating. There was a roof so we were protected from the sun and this worked out great. There were a lot of empty seats and we switched to the shady side of the boat once we figured out where the sun would be. Flying fish spotted from the ferry between Cebu and Bohol. Note: On the way back to Cebu after our visit to Alona Beach we rode on a different ferry line (Weesam) and it was also raining. This ferry was smaller and not as nice as SuperCat. Due to the rain they had plastic over the previously open sides of the “open air” seating. The plastic was no longer transparent due to age, and the whole situation was pretty hot and claustrophobia-inducing. If we had to do it again, we’d still do the outside seating on a nice day on SuperCat, but would pay for the indoor aircon seating if the weather was poor or we took the Weesam boat. The ride to Bohol Island was smooth and mostly uneventful except for several flying fish sightings. It was really fun to watch these little guys jump out of the water and skim along the surface as the boat churned up the seas. Flying fish lookout duty definitely helped pass the time for the twins during the two hour journey. When you arrive in Tagbilaran walk beyond the initial wave of people selling day tours and you’ll find a parking lot where vans and cars are waiting with their drivers. We understood the going rate for a private car to Alona Beach to be 500 pesos, so we offered that to a driver and he readily accepted. There are also trikes available on the road beyond the parking area, but the trikes on Bohol are smaller than their Boracay counterparts and wouldn’t have fit us along with all of our bags. We asked our driver bring us to Alona Bamboo House. We didn’t exactly have a reservation but we had communicated with them ahead of time to make sure they had space and they were expecting us (we’ve found text messages to be great for this). Alona Bamboo House is located near the west end of Alona Beach, just a 2-3 minute walk back from the beach. It’s an awesome spot with easy access to both the beach and the town center. We had a small hut similar to our Boracay resort, though a bit more substantial. It had solid walls and ceiling, whereas the Orchids hut in Boracay was all woven bamboo. However it didn’t have a hot shower (Orchids did). 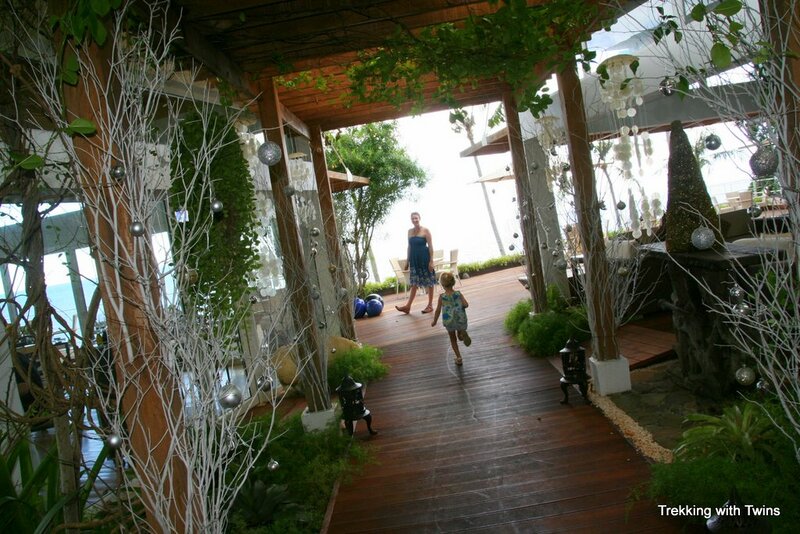 Our Alona Bamboo House hut had a nice porch overlooking the hotel’s private lawn and garden courtyard area. There was even a “Christmas tree” next to our hut complete with ornaments, perfect since we were there just before the holidays! Our Alona Bamboo House cottage. We paid 900 pesos ($20) a night for our private cottage. There’s one other cottage and several rooms as well. Adjacent to the lawn is a shared kitchen area that’s accessible to guests. They offer laundry service and we had a couple shopping bags of clothes cleaned for us for 250 pesos. We also looked into staying at Casanova Garden before deciding on Alona Bamboo House, primarily because Casanova Garden had a pool. Our kids, like most, love pools so even with an ocean close by that caught our attention. But we ended up choosing Alona Bamboo House for its location, which seemed closer to the beach than Casanova Garden (approximately 2-3 min. walk vs 10 mins. or more from other reviews – we never found it so can’t say from personal experience). The staff at Alona Bamboo House was also very responsive to our inquiries which gave us more confidence. We really liked staying in Alona Beach as a base for exploring Bohol Island. Like Boracay, Alona has a sandy path right behind the beach and there’s tons of restaurants, bars, and dive shops all along the path. There are plenty of places where you can eat with your toes in the sand. As a family with young kids, it’s important for us to be close to food and activities. Staying in Alona Beach afforded us the convenience of being able to run out to grab some pastries for breakfast and snacks to bring island hopping and return to the room all within 15 minutes. We loved having such a big variety of restaurant options close by too. The main mode of transport is walking. Alona Beach is not very long and you can walk end to end in under 15 minutes. There’s one paved road perpendicular to the beach that goes up to the main part of Alona town and that is about a 5-10 minute walk from the beach to town. To get to places nearby but out of the main town (like another nearby beach such as Dumaluan) there are motor trikes around that can take you. The attractions on Bohol Island are best reached by hiring a car and driver (see our post about our Bohol Island tour), which is easy and inexpensive. We ate a lot of good meals during our short stay on Alona Beach. The beach itself is packed with options, but be sure to check out some of the spots in town and around the surrounding area as well. One of our favorites (we went twice during our visit to Alona) was the Bohol Bee Farm Restaurant on Alona Beach (The Buzzz Cafe). Though our first visit was literally dampened by me spilling my delicious lemongrass juice all over myself, my backpack, the table, and floor, we still loved the food. Great pizzas and the pasta with mixed veggies is also excellent. All the food at the Buzzz Cafe is fresh, local, and there’s tons of vegetables! Seriously, the lack of vegetables in general in the Philippines is something that needs to be addressed and the Bee Farm is trying. The Bee Farm grows many of the veggies it serves at the restaurant, and you can take a free shuttle over to visit the farm and bees. Check with either the restaurant or ice cream stand (see below) for details. 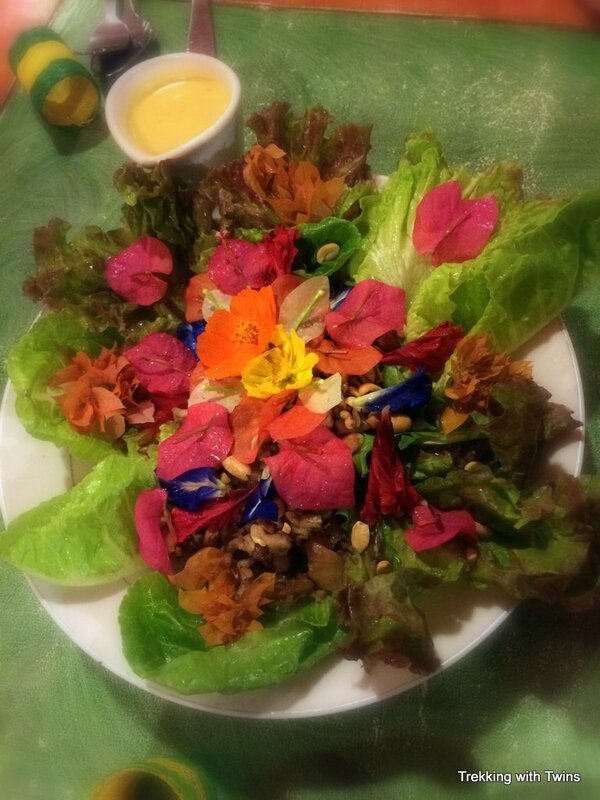 The rare salad sighting in the Philippines, this one featuring local flower blossoms at Bohol Bee Farm Restaurant on Alona Beach. Also, don’t miss the Bohol Bee Farm ice cream truck. It’s on the road between Alona Beach and the center of town, on the left side as you are walking up from the beach. They serve a big variety of flavors, mostly derived from local tropical fruits and vegetables (like jack fruit, durian, dragon fruit, and ube – a purple yam). The ice cream from the Bee Farm truck is all homemade and all super delicious. We were there almost every day. Kat and Aurora got an ube cone each time – Kat because she was addicted to the taste after one lick, Aurora because it was purple. They also serve the same ice cream at the location on the beach (it’s 10 pesos more if you buy it in the restaurant itself instead of from the stand downstairs on the beach). 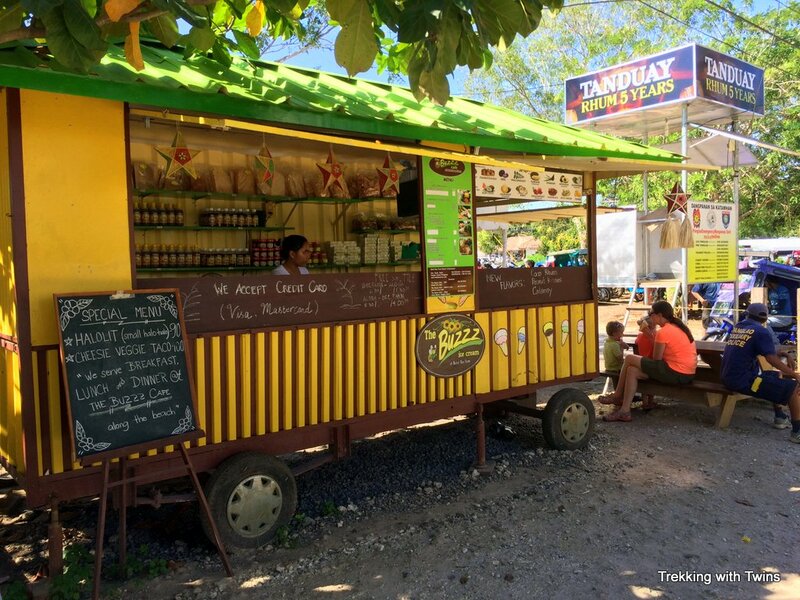 Bohol Bee Farm Ice Cream Stand. To say we were good customers is a major understatement. We also had a great dinner at Coco Vida where there are a bunch of tables out on the sand. The food was excellent, but what really stood out was the great lengths the staff went to in order to entertain the twins. They brought out sand toys and a plastic truck to play with. When Aurora threw a tantrum because Jasper would not share the truck, they brought another. When Aurora threw another tantrum because the second truck was not the same color as Jasper’s, they brought a third truck. Not that we want to reward the tantrums, but we were exhausted and they were clearly trying to keep the peace for their other customers. Graziella, an Italian restaurant on the road between Alona town and the beach, had good pasta but was a little on the expensive side. On this same road, closer to the main road, is Son Bakeshop where you can get a variety of delicious and inexpensive baked goods. Graziella restaurant on the road to Alona Beach. On the main road in Alona town is Biergarten, a German place with great sausages and cold beer at a fair price. Can’t ask for more than that. We actually stumbled on this place one night after finding out that Tarsier Paprika was closed. It was a happy accident, as often happens when traveling. On our last full day in Alona we finally managed to get to Tarsier Paprika and enjoyed one of the best meals we’ve ever had. 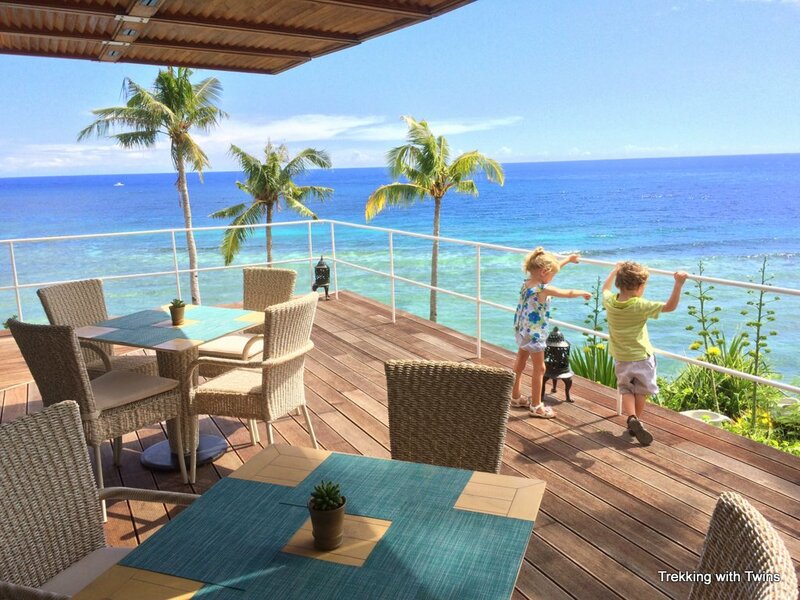 Aurora was super excited to explore the deck at the Tarsier Paprika restaurant in Alona. Located high above the beach the restaurant has sweeping views (see photo at the top of this post). There are also walking paths down to the ocean to explore, and a wide wooden deck and manicured gardens complete the scene. You can sit inside or out, and we grabbed a picturesque spot on the deck. The food is out of this world and the service matches. Wine has been hard to come by on our travels in Asia but Tarsier Paprika had a nice wine list and we thoroughly enjoyed a chilled bottle of Marlborough sauvignon blanc, bringing back fond memories of our travels in New Zealand. 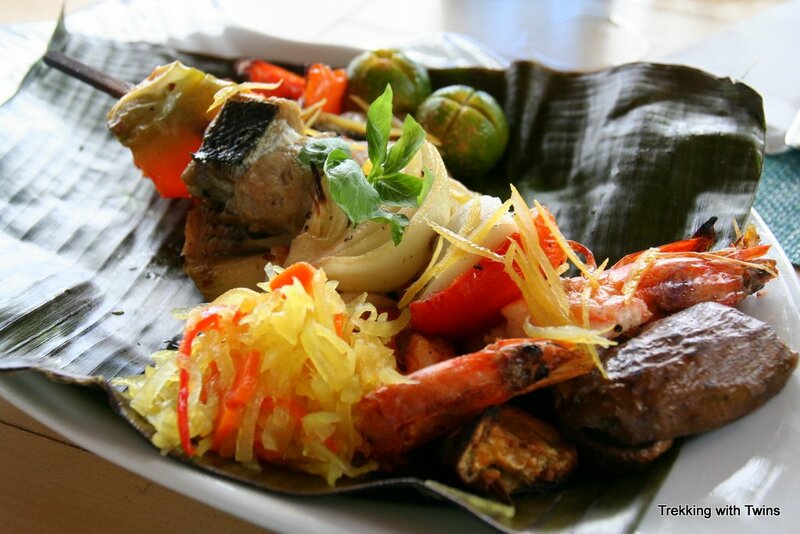 Seafood kebab served on a banana leaf at Tarsier Paprika. Tarsier Paprika is outside of Alona proper but it’s easy to get to. Simply go to the Tarsier shop in the center of town and tell them you want to go to the restaurant. They’ll send for their private jeepney and drive you round trip free of charge. Tarsier Paprika is pricey by Philippines standards but totally worth it. Alona Beach itself is not the best for swimming as there are lots of boats and the water is a bit murky due to the silty sand. Don’t get us wrong, it’s still quite pretty and from Alona you have access to stunning beaches on island hopping tours and even up the road at Dumaluan Beach. Alona is just not quite as postcard perfect as some other beaches. Similar to Boracay, there are plenty of opportunities to spend money to entertain yourself. Unlike Boracay, we actually participated in several activities here. We’ve written a few posts already about things to do in Alona Beach and Bohol Island, so refer to them for more details. Balicasag Scuba Diving… with Twins! Most activities can be arranged right from the beach, including the Bohol Island tours. You will have to try hard not to notice the folks selling various tours as you walk along, though they’re not quite as pushy as in Boracay. Negotiate on price as the first number is usually not the bottom line. Just be friendly about it and it’s actually an enjoyable part of the experience. Try to talk to the actual service provide (e.g. boat captain) rather than a middle man. Our total cost to visit Bohol Island and Alona Beach for 8 days averaged out to $101 per day, including round trip transportation from Cebu City. Our biggest expense was food at $40 per day (40% of total), followed by activities and entertainment at $34 per day (33% of total). The various tours, and especially the scuba diving drove up the activities cost. Accommodation was just $20 per night (17%). Transport was $71 total (9%), and most of that was getting between Cebu City and Alona Beach on the first and last days. Have you traveled to Bohol Island for a family vacation? Feel free to chime in with comments below to tell your stories or ideas for things to do, or just to say hi! Sun setting over Alona Beach. It’s a bit surreal to read this and look outside at the 2+ feet of snow on the ground now with another foot coming on Monday! We’re absolutely buried! Oh, I almost forgot… near record cold last night: ~10 below! Gotta go rake some roofs before they collapse under the weight of the next 1-2 feet, which arrives tonight and tomorrow. I am loving all your Philippines posts. They are definitely cementing my desire to go back to the Philippines later this year. It just looks so beautiful. I love your video too! Thanks Sharon!! We had such a blast in the Philippines.